Say what you will about Superman or Spider-Man, a strong case could be made for the first X-Men film putting the superhero movie genre on the map. 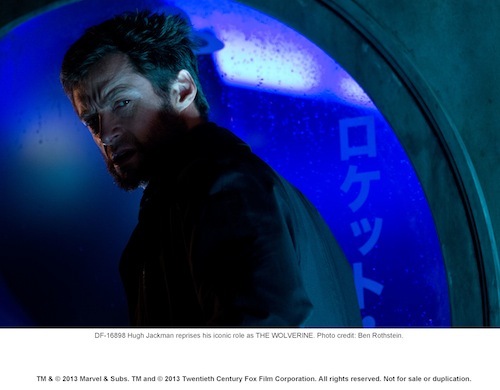 And if you agree with that premise, then you likely agree that Hugh Jackman’s performance as Logan (a.k.a. Wolverine) has a lot to do with it. Now Jackman is back playing Logan for his 5th time in The Wolverine, a standalone story set several years after X-Men: The Last Stand. Much like The Dark Knight or Man of Steel, The Wolverine takes a more intimate approach to the character, strips away a lot of the unnecessary fluff, and delivers what may be the best X-Men movie in the series. Rather than populate the film with an unnecessary amount of comic book cameos and overly bombastic, comic book-y scenarios, Director James Mangold chooses to pare things down to the bare essentials of the character, and the film is all the better for it. In a lot of ways, The Wolverine‘s narrative is driven not just by this outlandish character with superhuman healing abilities and an adamantium skeleton, but also by some very traditional themes. Loss, immortality, love, and honor are all key touchstones in Wolverine’s story in the comic books, and they are well conveyed in the film. As some may know, Japan (where this particular film is set) plays a major role in Wolverine’s story arc in the comic books, and this film perfectly illustrates why. The delicate, composed demeanor of the Japanese people is a great juxtaposition for the ham-fisted approach that Wolverine employs. This point-counterpoint idea makes for some interesting story beats – as Wolverine thrusts himself headfirst into the film’s complex plot – and helps make the action dynamic and exciting. My one major gripe with the film is its story, which comes across as far too busy. At first, it seems like The Wolverine is about Logan’s quest to become mortal, and finally shed the pain he’s been carrying all his life. However, rather than delve too deep into ideas like what it means to be immortal or how a character can go on after watching his closest friends die, the film shoehorns some fairly generic plot points, and abandons the immortality idea altogether. It’s only because Wolverine is at the center of it all that I wanted to push forward and see how things wrap up. And, of course, I would be remiss if I didn’t mention Jackman’s performance as the titular character. In this film especially, you can tell that Hugh Jackman loves playing Wolverine, and if he could he would play him forever. His physical dedication alone is worth commending, but the way in which he brings such a surprisingly nuanced character to life is so much fun to watch on screen. If 20th Century Fox had positioned The Wolverine as the first solo film for the character, there’s no doubt in my mind that fans would be chomping at the bit to see Jackman return again and again. The film perfectly captures the essence of the character, from his “beserker” rage to his compassionate righteousness, and folds it into a story that only works because of this compelling character. Like its title character, The Wolverine is a little clumsy, occasionally silly, and leaves itself vulnerable to quick (critical) jabs. It’s only because the film’s core character is so solid that it stands up against any serious criticisms. Unfortunately, as it stands, there’s only one more X-Men film left for Jackman before he presumably hangs the adamantium claws up for good. That being said, if there was a solo film to go out on The Wolverine is it, as he proves the man with the claws can still cut it with the best of them. After four films you would think there wasn’t much action potential left in a man with retractable claws. Yet, The Wolverine finds some very clever ways to utilize a character with a high tolerance for pain and an indestructible skeleton. The action scenes are choreographed in such a way that Wolverine comes across not as a skilled fighter, but as a bull in a china shop. There may have been hints of it in past films, but this is the type of Wolverine action fans have been longing to see, and putting the character up against more composed fighters (ninjas, martial artists, other mutants) helps the fight sequences feel fresh and engaging. Of particular note is a bullet train sequence about halfway through the film, which by all accounts is mostly CGI but doesn’t look it at all. 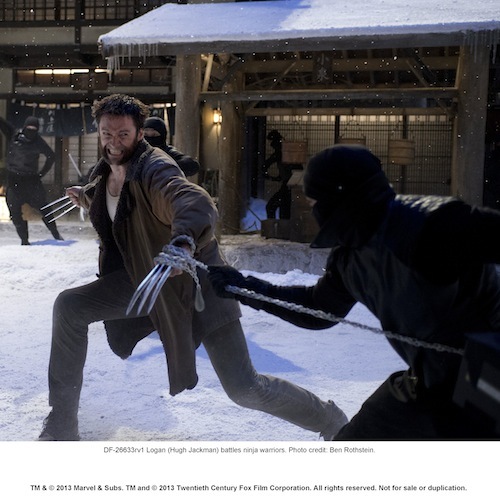 The scene features Wolverine fighting inside, alongside, and on top of a speeding train, and it doesn’t come off as overly goofy or fake. There’s even a little light humor thrown into the sequence to make it both fun and engaging. The Wolverine‘s third act steps a little too far off the deep end, choosing to put Wolverine up against a massive CGI character in a final showdown that feels out of place amidst the more practical (or practical-feeling) stunts. There are still some interesting elements to the final fight, though; it’s just a shame the filmmakers couldn’t have come up with something better.